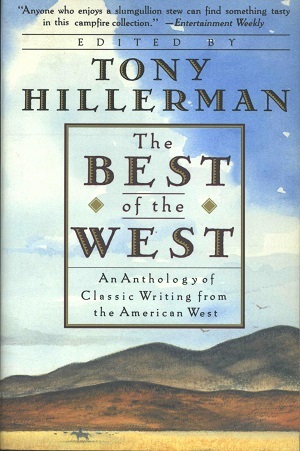 This is the paperback edition of The Best of the West: An Anthology of Classic Writing from the American West, edited by Tony Hillerman and published by HarperCollins Publishers in New York City, NY. In this anthology, Hillerman, with the aid of Jack Rittenhouse, assembles a collection of fiction and non-fiction writings about the American West. Hillerman also provides the introduction as well as commentary throughout the anthology. Format: Paperback, 20.2 x 13.5 cm. Binding: Paper covers with full color illustration. The title, editor and publisher are printed in gold on the spine.